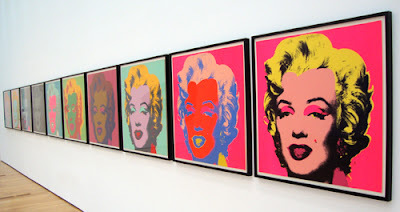 The High Museum of Art has a collection of spectacular Andy Warhol Marilyn Monroe paintings. Warhol's depiction of the Hollywood icon heralded in the style and age of Pop Art. Displayed in linear fashion, the bright Marilyn paintings catch the eyes of museum-goers who immediately recognize them as Andy Warhol's work, even though you'll see the occasional visitor double-check the placard to ensure they are indeed by Warhol and not just Warhol-inspired (I do that sometimes myself). Located in the Modern & Contemporary Art gallery, the portfolio of 10 Marilyn silkscreens are certain to illuminate one's imagination and cause one to ponder Warhol's fascination with Marilyn Monroe.